I didn’t discover whether the students knew the answer or not as this conversation coincided with a sparrowhawk homing in at huge speed on the myriad small birds waiting their turn for our bird table. So much excitement. Anyway, yes, fern fever or pteridomania was rife in Victorian times taking over the obsession for roses in the earlier part of the nineteenth century to the extent that men, women and children would risk life and limb, sometimes with fatal consequences, trying to reach and dig up native ferns growing in ravines, above fast flowing rivers and other rather dangerous sites. Some of them went out into the countryside armed with fern trowels especially designed for the job. I did notice one for sale on eBay this morning, for the princely sum of £120.00. 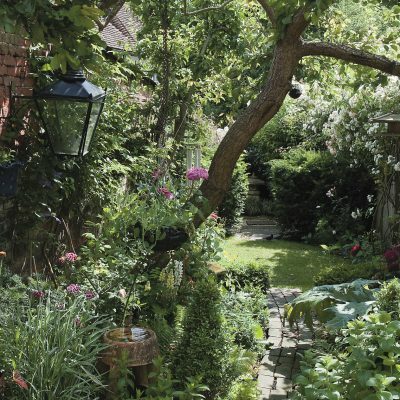 This ‘fever’ coincided with the craze for greenhouses and all manner of garden rooms in Victorian gardens as well as special fern houses where they could show off their collections and improve on their social cred. Their cold, often dark and polluted houses became full of ferns especially after the introduction of the Wardian case by one Dr Nathaniel Ward. He realised that ferns grew well in nearly sealed containers and thus every house that possibly could, had ferns growing indoors in either a fern case or terrarium. Not only that, Victorian houses and public buildings were often embellished with ironwork incorporating fern imagery. Ferns decorated every possible object in a Victorian house including wallpaper, tablecloths and curtains. The craze even extended to ferns being carved onto coffins. Ferns are an ancient family of plants. Work done on early fern fossils has established that they pre-date the Mesozoic period of over 360 million years ago. They are older than the dinosaurs and any land animals and thrived on the Earth for 200 million years before any flowering plants evolved. They are a member of a group of vascular plants that do not flower or set seed but reproduce via spores and have very specialised tissues that conduct both water and nutrients around their structure. 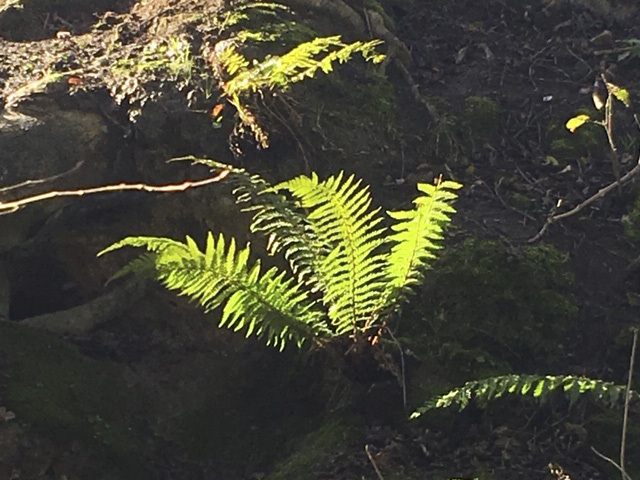 One of the most exotic-looking ferns growing in the UK are the chain ferns or woodwardia. To say that they are theatrical is an understatement. The fronds of Woodwardia unigemmata, AGM can reach 1.5 metres and the croziers are a rich and vibrant dark orange when they emerge in the spring. Once the plant matures, it grows young plants on the tips of its fronds which arch over and take root. 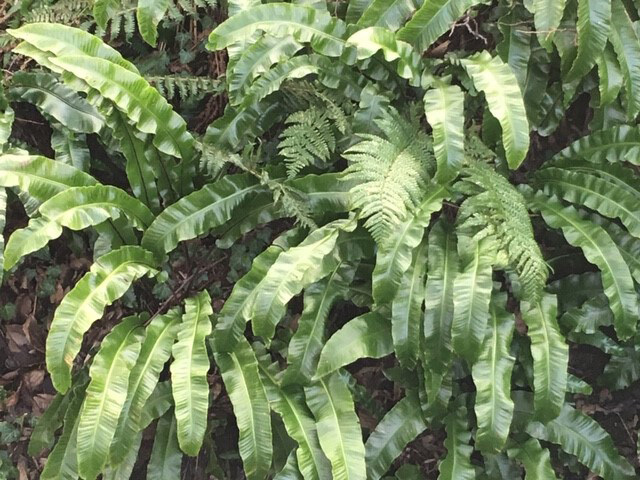 The reason for the name ‘chain fern’ is that their sporing bodies are arranged on the back of the fronds in a row resulting in a chain-like pattern which shows through to the top of the frond. 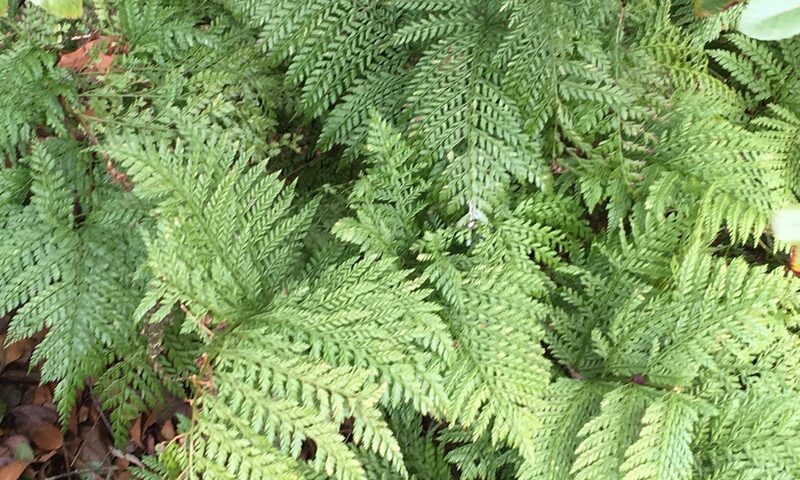 I had a good look at the fronds of the woodwardia that I spotted at Great Dixter recently (it’s evergreen which is all the more reason for growing it) and the chain pattern was very pronounced on the top of the frond. That one is growing in a very sheltered position protected by a wall and by various shrubs which keep the winter winds from shredding its fronds. Woodwardia fimbriata is another giant chain fern with fronds up to six feet long and whilst it is hardy down to about -5 degrees C, it is happiest in a moist soil and a sheltered aspect. Or perhaps in a pot which can be moved into a greenhouse or garage during the winter. If left out, bracken (another fern) wrapped around the base will help protect the plant. If you do decide to keep ferns in a pot, a good growing medium would be three parts multi-purpose, part loam and part horticultural sand. A grouping of the evergreen or wintergreen ferns is so beautiful particularly in small or courtyard gardens where they provide such fabulous winter interest and work well with emerging winter aconites, snowdrops and hellebores. Evergreen ferns can be good in shaded, perhaps dreary spots. Blechnum chilense, AGM, a large fern with dark green narrow leathery leaves is good for this sort of site but also looks amazing in a pot. Native to Chile, it apparently lines the sides of the roads there. There are so many thousands of ferns to discover, mostly with unpronounceable Latin names but don’t be put off as their common names are much more manageable. Take the tatting fern, Athyrium filix-femina ‘Frizelliae’, whose fronds resemble lace tatting. This is hardy and deciduous and so very decorative. Each leaflet looks like a little ruffled fan. These ‘Lady Ferns’ were amongst the many ferns that were so popular with the Victorians when there were hundreds of named forms. 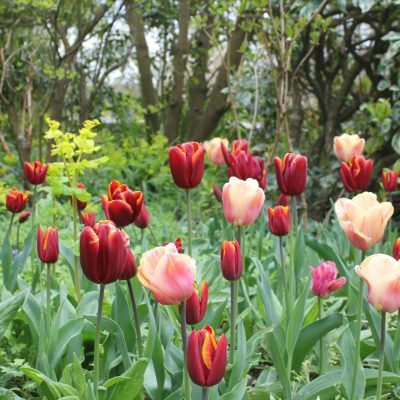 This one was named after a Mrs Frizell who discovered it in Ireland in 1857. Another named form was found by a Victorian student called James Cosh who apparently stepped on the plant as he jumped over a wall. The leaves break from the stem at an angle forming a V shape and thus the plant was named after Queen Victoria. Hence Athyrium filix-femina ‘Victoriae’. There are ferns for every situation, even the driest patches under trees. Try aspleniums, polypodiums and polystichums in dry shade but give them a good start by incorporating leaf mould, bone meal and plenty of organic matter. Keep them well watered until they take off and you should be fine. The native Asplenium scolopendrium seems to be lining ditches and shady stream banks whenever I’ve seen it, but it seems to be a survivor and can cope with drier conditions. The little asplenium that clothes walls in great profusion, particularly in old stone walls in the West Country, is now known as Asplenium ceterach or more simply, the rusty-backed fern, and was used in its guise as a spleenwort to treat diseases of the spleen. You know these ferns are survivors as in hot weather the leaves wither and you lose sight of them, but as soon as the rain comes, they spring to life again. 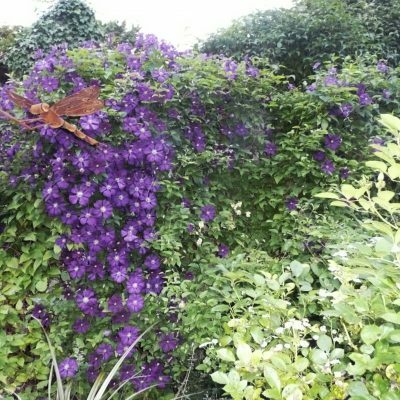 Sue Whigham can be contacted on 07810 457948 for gardening advice and help in sourcing and supply of interesting garden plants.